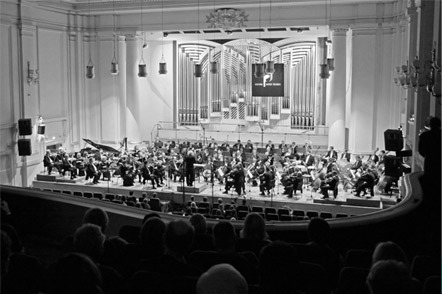 The Festival has been organized since 2005 by the Polish Music Association, founded by a group of musicologists, culture managers and music lovers. The essence of the festival is not only to present valuable works by Polish composers, written from the Middle Ages to the present day, but also to contrast them with the world's music and display them in various contexts. The organizers aim to mobilize the creation of compositional art by commissioning and premièring works of contemporary music. To date, the festival's stars have included pianists Ivo Pogorelich and Nicolai Khozyainov, world-famous violinist Nigel Kennedy, as well as the Academy of St.-Martin-in-the-Fields, the London Sinfonietta, Elżbieta Chojnacka, Akiko Suwanai, Piers Lane, Peter Jablonski, Jonathan Plowright, Grigori Zhyslin and many others. Such distinguished personalities on the Polish music scene as Krzysztof Penderecki, Agnieszka Duczmal and Jerzy Maksymiuk have also appeared, and the Festival has hosted such distinguished composers as Wojciech Kilar, Henryk Mikołaj Górecki and Paweł Mykietyn. Monday 2:30 p.m. - 6:30 p.m.
Friday 2:30 p.m. - 5:30 p.m.